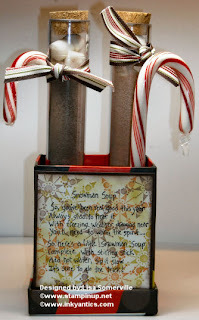 Another quick and easy project - using up those $1 boxes I "had to have" from Michael's....I filled my test tubes with a packet of hot cocoa and a few marshmallows, then tied on my Alpine Ribbon. If your looking for Test Tubes or similar packaging- you can find them here. I will be working on some new templates for these tubes - so be sure to check back! I made an insert for the inside out of Chocolate Chip card stock, punched two 1" circles to hold my test tubes, and two 1/4" circles to hold my candy canes. (I had to punch the 1/4" circle twice in one spot, slightly overlapping so that the hole would be wide enough. It's sure to do the trick! oh my goodness! now this is way too cute!! great idea!